As spring approaches, we should all be aware that our pest problems will reappear. There are many types of pests to consider: insects, weeds, nematodes, and even some vertebrate species (such as the Cuban tree frog). When combined with good cultural practices (limiting supplemental water, mowing at the correct height, and proper pruning), the cool winter weather will knock back most pest populations. However, if you have had a pest problem in the past, it will be back! Most pest problems occur in cycles and may take several years of good management to eliminate. As with any pest concern, a proactive approach helps keep you ahead of the problem. The first, step in being proactive is monitoring, and proper identification of the problem. This is where your local UF/IFAS County Extension office can help. You can always bring pictures or samples to one of our offices for assistance with identification and proper treatment recommendations. Keeping track of when you first noticed the problem can be a big help, as you can use this as a starting point to know that you need to look for the issue earlier. Also, treating repeatedly with broad spectrum pesticides can cause you big problems in the future. Broad spectrum pesticides will kill off both the good and bad bugs, leaving you little to no natural protection. So what are responsible options? First, you can use environmentally sound products such as horticulture oils (Neem oil, Organocide) or horticulture soaps (such as Safer brand or Garden safe) for pest problems and hand pull weeds. Hand pulling weeds is not the answer most people want to hear. However, it is still the most effective method of weed control and is better than any chemical if completed prior to the weed reaching a mature reproductive size. Invasive species are one type of pest problem that have species from all of the categories mentioned above. Several species to be concerned with locally include cogongrass, air potato, Brazilian pepper tree, fire ants, Caribbean crazy ants, cane toads, iguanas, coyotes, rhesus monkeys, Burmese python, Chinese tallow trees, camphor trees, and tropical soda apple just to name a few. Each invasive species needs a special treatment recommendation and an in-depth plan to keep them from spreading and becoming naturalized in our environment. The State of Florida spends over $500 million dollars each year attempting to keep these harmful introduced species at bay. One option when treating some pests and invasive species (such as air potato vine) is biological control. Biological control is the control of a pest by the introduction of a natural enemy or predator. The development of a successful biological control agent for a problem non-native plant begins with rigorous procedures for identifying and testing potential organisms. What biological control is available to me? 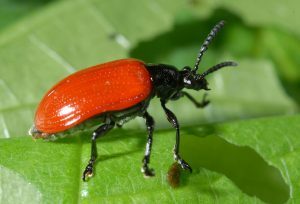 Air potato beetles are available for residents of Florida at no charge. These beetles will eat the leaves of the air potato plant and can significantly reduce the ability of this plant to spread and reproduce. These beetles have been thoroughly tested to make sure they will only eat air potato. They will not even consume winged yam, a closely related exotic vine, or two related native plants, Florida yam and four-leaf yam. Biological control for citrus greening is now available to Florida residents at no charge and comes in the form of a tiny wasp (Tamarixia radiata) which hunts the Asian citrus psyllid. Tamarixia radiata does not bite or sting people. The release of this parasitoid was found to be very effective at reducing the Asian citrus psyllid population within one year of their release in India in 1978. The life span of adult Tamarixia ranges from 11 – 24 days and it takes them 11 days to mature from eggs to the adult stage. In addition to killing Asian citrus psyllid nymphs through parasitism, adult females feed on younger nymphs as well as on the honeydew excreted by the Asian citrus psyllid. Other biological control options include lady bugs, green lacewings, predatory mites, parasitic nematodes, parasitic wasps, and microbial insecticides. Lacewings and lady bugs are beneficial insects because they eat aphids and other pests, and they don’t bite or sting.